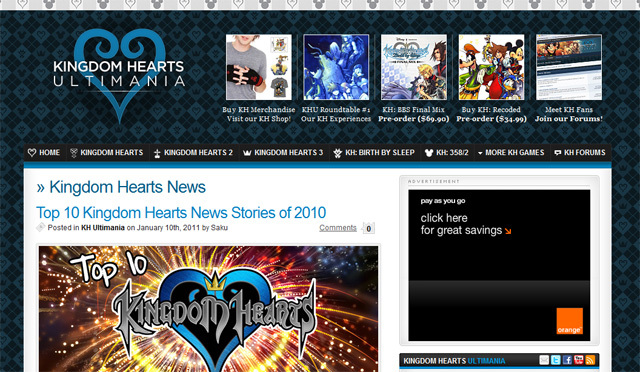 Myself and a few friends put a lot of effort back into ‘relaunching’ Kingdom Hearts Ultimania towards the end of last year – a site I originally developed in 2004 that grew out due to my then teenage Video Gaming OCD. Despite it’s niche audience, the above ‘News Feature’ is a great example of how to produce original content complete with that social media twist. Nice Headline? Check, Internal Links to Other Content? Check, User Interactivity Points? Check. Regardless, it’s a nice moment to feel proud that the relaunch has been a markable sucess, with ad-revenue, visitors, time-on-site and user activity all risen. My advice? If you’ve got a website growing cob-webs, take a plunge at revisiting it to see how you’d approach things now..